Offered is a lovely pair of early American coin silver sugar tongs marked Gordon in italicized lettering on each arm; this mark resembles one of the maker's marks attributed by the Darling Foundation to George Gordon of Newburgh, NY, working circa 1800-24. The only difference is that the mark in the Darling book also has a first name initial - G.GORDON in italicized lettering. It may be that the die for this mark was damaged and re-cut to eliminate all but the last name. It is also just possible that this mark is actually one used by Alexander S. Gordon of New York City, but he died around 1803, probably just a few years too early for this piece. Finally, Benjamin Caldwell shows this mark as being for Robert Gordon of Nashville, Tennessee, working circa 1817-20. He shows a ladle with this mark that had a Nashville provenance and what he considered to be Tennessee style attributes. 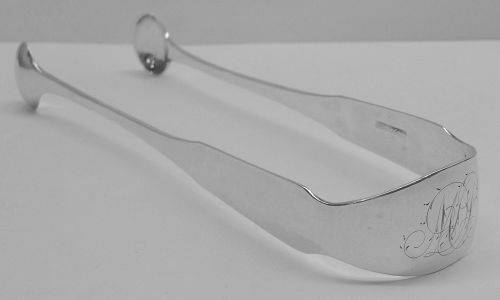 This pair of tongs should date to about 1805-10 by style, but could be several years earlier or later. This piece has a lovely period script monogram to the bow, and a good legible maker's mark. It measures about 6 1/2 inches in length and weighs about 48 grams. Condition is very good overall, with modest wear from normal use and no dents, splits or repairs. All in all a fine example of an early transitional form in American coin silver!